John Anderson was a confectioner on Serpentine Street in Copper Cliff for over 30 years. He was born December 21, 1830 at Ryde, Hampshire. Restless in his youth, he left the lovely island at the age of 13 to go sailing, and sailed for over 33 years. 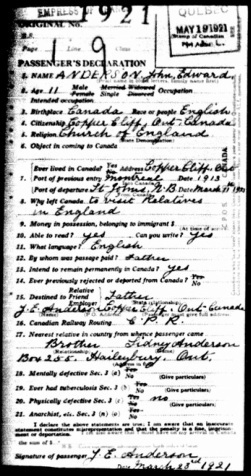 John came to Copper Cliff in 1896. He had started in the employment business in Sudbury in 1901 and was doing very well, when one of the Hamilton boys of Copper Cliff suggested that he go into the confectionery business. John knew nothing about running a store, but with the aid of his friends he soon learned how. One of his first capable clerks was Nellie Bell, daughter of John; another was Florence Peake, Ernie' sister. Everybody remembers the kindly old salt who took the whole populace of Copper Cliff to his heart. John loved poor people. He ran an annual picnic to Nickel City on the Vermilion River, as a special treat for the children of the needy. He would charter a Canadian Pacific Railway special train to handle the party, and he never forgot them at Christmas time. He was keen about lacrosse and football, and for some years coached and managed teams in town, donating cups to spur interest among the boys. In 1907, he introduced the Anderson Cup to the impromptu league. The silver cup went on to serve as the championship trophy for the Sudbury District Football Association. In order for a team to keep the trophy, they had to win it three times in a row. John’s wife Elizabeth Morris was born at the Isle of Wight on October 28, 1870. When she was old enough she married a man named Jenkins, son of the proprietor of a hotel at Brightstone, By the Sea. When Elizabeth was a widow, John went over there and married her at Newport, on October 4, 1907, bringing her to Copper Cliff, where he had a nice candy shop. In December of 1913, while the Copper Cliff Band was having a practice session, there was a knock at the door. John Anderson was there, loaded down with a cargo of soft drinks and cigars which he distributed around among the bandsmen. The band then went in a body to the store and serenaded John and his wife. The Copper Cliff Public School teachers were guests of John Anderson who took them to see ‘Brewster’s Millions’ at the Grand Opera House in Sudbury in May of 1914. John was constantly doing things like that and was probably the most popular man in the district. His deeds of charity were numerous. In the spring of 1914, John took a trip to Toronto and came back with a complete new set of showcases and ‘silent salesmen’ (packaging, displays, signs or promotional products designed to increase sales and profits) for his ever-popular store. John’s business prospered. In August 1915, he took over the premises next door in the Turner Block on Serpentine Street, formerly occupied by John McBeth, tailor who went into the old Bank of Toronto section of the McIntosh Block when the bank moved to new quarters across the street. In 1916, ‘Old John,' as he was affectionately called, headed a campaign in Copper Cliff to send packages of smokes for sailors and soldiers. In November of 1917 a cigar lighter was installed in his store, just to be up-to-date. Three times the happy couple made the trip to the lovely scenes of their birth. In 1923 John became totally blind and very deaf. His wife would sit in his lap and devotedly read to him, in the still evenings. In the afternoons, besides running the business, she attended to church duties. John, beloved by everyone, passed away at 88, on December 17, 1933, to be followed 15 years later by his wife. In April, 1944, at the age of 74, Elizabeth left Copper Cliff, with a cherished gift from the Women's Auxiliary of St. John Anglican Church, where she had served for 30 years. It was a gold pin in form of a Greek cross, and was accompanied by a life members’ scroll, presented by Mrs. Sleaver, president of the society. Elizabeth and John had three sons, John Edward ‘Ted’, born 1910, William Henry, born September 16, 1911, and Sidney Barton. In World War II, Sidney enlisted as a Private in the 159th Battalion of the Canadian Infantry. William ‘Pug’ published the Copper Cliff Chronic, a cheerful mimeograph sheet, which was sent to Copper Cliff boys in the armed forces in World War II, along with contributions of cigarettes and candy. Ted worked at the King Edward Hotel desk, and Sidney, at Inco offices.